Tavis Lynch is a serious mycologist from northwestern Wisconsin. He has been studying fungi for most of his life and teaches several mycology classes for Wisconsin Indianhead Technical College. He has been a commercial mushroom forager for many years and has been cultivating mushrooms on a large scale for about 6 years. 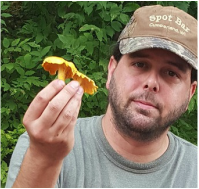 He leads several public and private forays throughout the year and is a certified mushroom expert by the Minnesota Department of Agriculture. Join the North Chapter Facebook Page here. Tavis's forays meet at his house. Chetek, Wisconsin - Click on the link below for a detailed map. Click on the link below for a detailed map.